Sunday Morning Professor Chuck (see if you can find him in the photo left- kind of a "Where's Waldo?" aspect to today's post...) and I hiked up the Avenues trail in Jeremy Ranch to confirm the Quercus gambelii x turbinella hybrid clone I found 2 weeks earlier. This is the 3rd hybrid I’ve found over the last year, and the story of these hybrids and how I located them has been one of the most interesting things in my life over the past year. 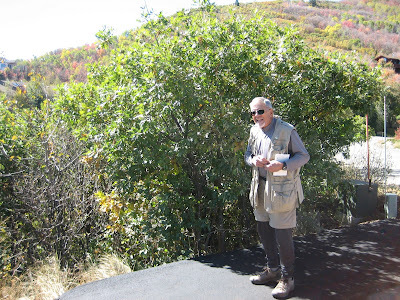 Way back when in May, I talked about scrub oak, specifically Gambel Oak, which grows everywhere around here, and is the only naturally occurring oak species in the Northern Wasatch. I also talked about deciduous oaks and live oaks, and how Quercus is an unusual genus in that it has plenty of both deciduous and evergreen, or “live”, species. 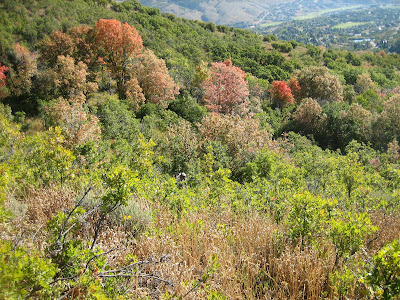 In Southwestern Utah, down around St. George and Hurricane, there’s a live oak: Shrub Live Oak, Quercus turbinella. Turbinella’s all over the place down there; if you’ve hiked in Zion or biked on Gooseberry Mesa, it was all around you. It’s low, shrubby and scratchy, and only occasionally grows into the form of a small “tree”. (There are some good Turbinella “trees” in some of the deep slickrock crevices on Little Creek Mountain, in the same area as the relic Ponderosas.) The leaves are small, leathery, and ovaloid with distinctly pointed tips or bristles. Common as it is around St. George, its range has a hard stop around New Harmony, at the North end of the Pine Valley Mountains. Turbinella doesn’t make it in the cold winters of Central and Northern Utah. 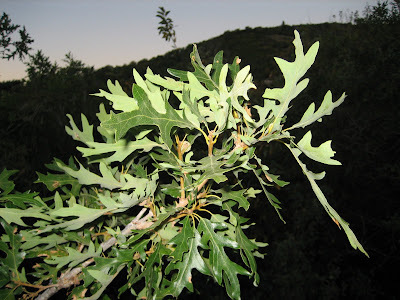 Gambel Oak also occurs down around St. George, especially around the lower slopes of the Pine Valley Mountains, and where the 2 oaks grow together they often hybridize, displaying a variety of different leaf forms, with characteristics of both species. 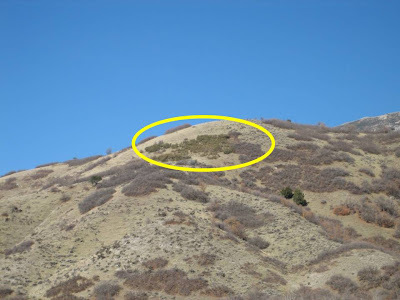 Cottam and Drobnick theorized that the hybrids are relics from a time when Turbinella grew clear up along the Wasatch front, and that this time was most likely a period of significantly warmer temperatures called the Altithernal, or Hypsithermal, about 5,000 to 7,000 years ago. Though their Turbinella forebears had long since vanished with the cooling climate, a few hardy hybrid stands survived in pockets, primarily through cloning, ever since. These clones represent continuous stands 5,000 to 7,000 years old. I’d known this for some time. I’d heard that there were some hybrids in the Oquirrhs, and on a couple of hikes in that range over the years I’d kept half an eye out for them, but I didn’t really know what I was looking for. 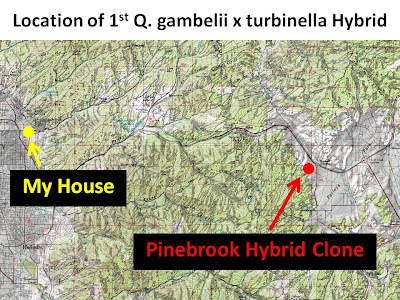 In July of last year there was an article in the Tribune about the discovery of another Gambel-Turbinella hybrid in the This Is The Place Park, about a ¼ mile from my house. The article included a photo of a sample leaf, and it’s discoverer, a retired U. of Utah biology professor named Chuck Wullstein. I saved the article, intending to go over and look at the hybrid sometime soon. 6 weeks later I was mtn biking before work up in Pinebrook. I was doing the closest thing I have to a “standard route”, which is about a 10 mile loop with several climbs and descents. About 2 miles into the ride is the first descent, which goes through 13 very, very tight switchbacks, before letting out on a “road”, which is actually the mouth of driveway of an out-of-sight gazillion-dollar Park City home. On my morning ride I’ll often pause here to pee before continuing on the ride, which follows pavement for another ½ mile or so before picking up the trail again. Tangent: I almost always do this loop- I call it “PBX”- clockwise, so as to go down the 13 switchbacks and up the ½ mile of pavement. Every once in a while I’ll do it in reverse, which can be frustrating, as I’m never able to clean all 13 switchbacks going up. I got 11 in 2004, then not again until 2007. Yesterday morning, 9/16/08, I cleaned 12 going up. Nested Tangent: My friend Cory cleaned all 13 going up back in 2004. Over the next 2 weeks I made several more trips to the driveway oaks, collecting leaves and comparing them to the photo. The leaves seemed to match, but I was skeptical. 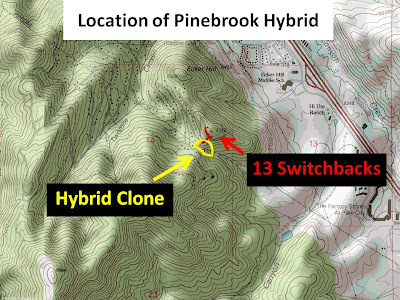 The hybrids I’d heard about occurred low down around 5,000 feet. This stand was at 7,000 feet. And all the known hybrids were on the West slope of the Wasatch, not the East. I brought some leaves over to the horticulture lab at Red Butte Gardens, and spoke with the manager of the lab (both unhelpful and unknowledgeable) and one of the employees, who was helpful but skeptical. He said it was definitely a hybrid, but thought the location was too high, and that it was probably a hybrid with some domesticated oak. I thought about this. The stand is huge- at least 60-80 feet across and 8 feet high. It’s been there a long time. I’ve never seen a domesticated English Oak or White Oak, or any other non-Gambel Oak anywhere around Pinebrook, Jeremy Ranch, or Park City for that matter. I wasn’t buying it. Chuck: Are you sure it’s an Oak? Me: Yes. I’m an amateur, but I know for certain it’s an oak. Tangent: Back in the early 1960’s, a ranger up in Yellowstone called Walter Cottam with a lead on a possible hybrid. Cottam drove clear up to Yellowstone (7+ hours.) the “hybrid oak” turned out to be a Maple. Chuck: Where’d you find it? Me: Outside Park City, at about 7,000 feet. Chuck: It’s probably not a hybrid, too high. Me: I collected some leaves. Could I show them to you? Chuck: I’d need to see the whole plant. What is the aspect of the clone? Chuck: When can you take me up there to see it? Over 2 succeeding visits we surveyed the clone and marked its rough boundary with tape. It’s far larger than I initially thought- over 100 feet across. 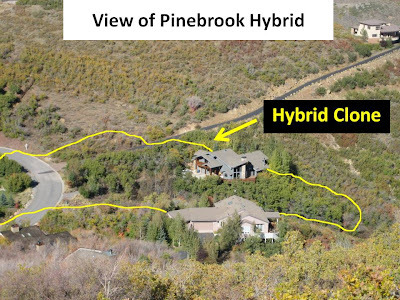 It’s either the highest- or one of the highest- such hybrids ever located. It’s one of the biggest hybrid clones found, and the first one found on the East slope of the Wasatch. Much of it- the heart of it- has been lost to the driveway and roadway, but the clone still stands, growing and thriving. I ride through it a couple dozen times a year, and every time I marvel at this living relic, older than the oldest bristlecone or redwood, and the satisfaction of having discovered it. Clarification: When I say "older than..." I mean the clone, not the individual trees. 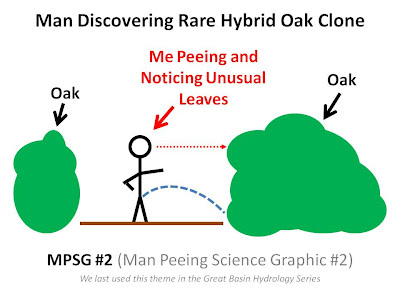 These hybrid oak clones are old in the same way Aspen clones are old. First Snow and Why Am I So @#$! Cold?